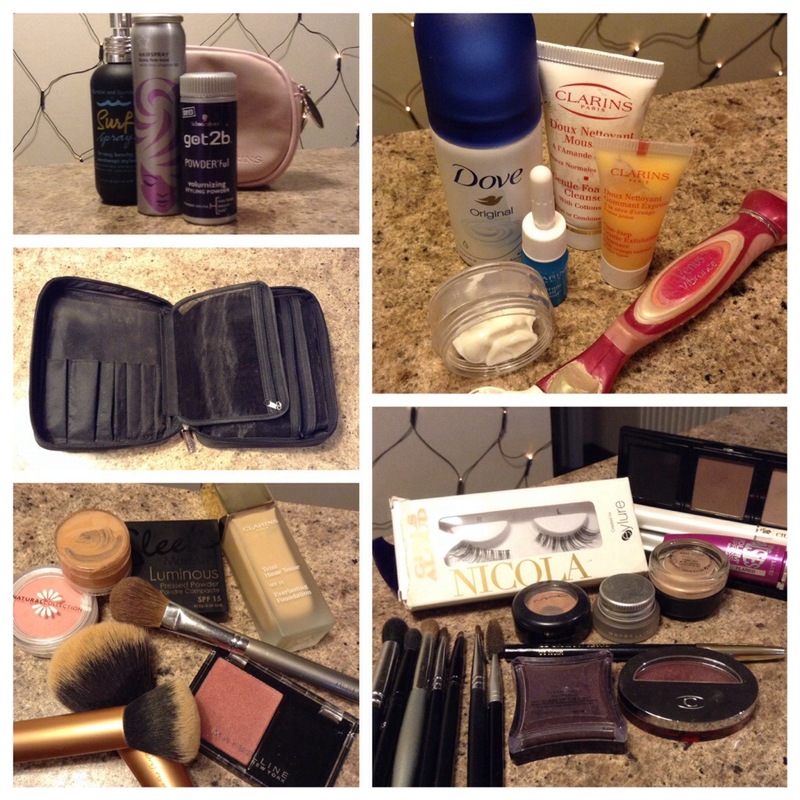 My Packing Challenge: Weekend Away Beauty – The Beauty Spot. It’s a really good size and does fit full size brushes, except for my stupidly long handled blush brush (I do squeeze it in as I don’t have an alternative at the moment!). 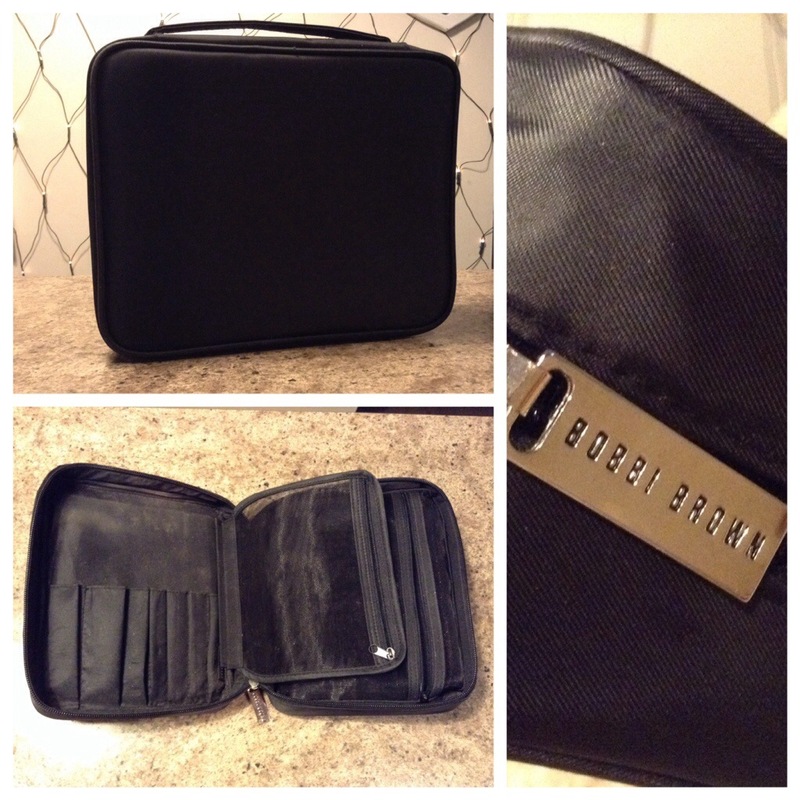 It’s a fairly hard case so it holds it’s shape, and it’s also partly wipe-able so cleans up if needed. Clearly I don’t clean it after use because you see where my dirty brushes have been! Top left: hair. These have had to go in another bag, however it’s a small makeup bag so I’m not going to be too hard on myself for that! I’ve gone for the products that are good for messy undone hair: Bumble and Bumble Surf Spray, small Superdrug hairspray and Swarzkopf Powderful. Top right: mini mini skincare and body stuff. I’m going away to a friends house so will be able to borrow some shower products, but the rest are: Clarins Gentle Foaming Cleanser/One Step Exfoliating Cleanser, Clarins Bi-Phase Serum, Clarins HydraQuench Cream (in the pot), Dove miniature deodorant, Venus Razor..
Bottom right: eye products! I’ve got my core items that I always use (Bobbi Brown 3 pan palette, Mac Paint Pot in Bare Study, Mac Naked Lunch, Lancôme Khol Pencil, Lancôme Cils Booster Mascara, Maybelline The Falsies Mascara) but added in the plum shades and lashes for my look on one of the nights: Illamasqua Pure Pigment in Queen of the Night, Clarins single eyeshadow Perfect Plum, Maybelline Gel Eyeliner, Eyelure false lashes by Nicola Roberts. And lastly, face products! These are my core products, I use most of these every day but I have put in an extra blush in case I want a slightly different look. Clarins Everlasting Foundation, Sleek Makeup Luminous Powder, Natural Collection Blush, Maybelline Blush, Clarins HydraQuench Tinted Moisturiser (potted), Collection Lasting Perfection Concealer (not pictured). I’ve needed to include the Tinted Moisturiser because this is what will deepen my foundation as I will have fake tan on. 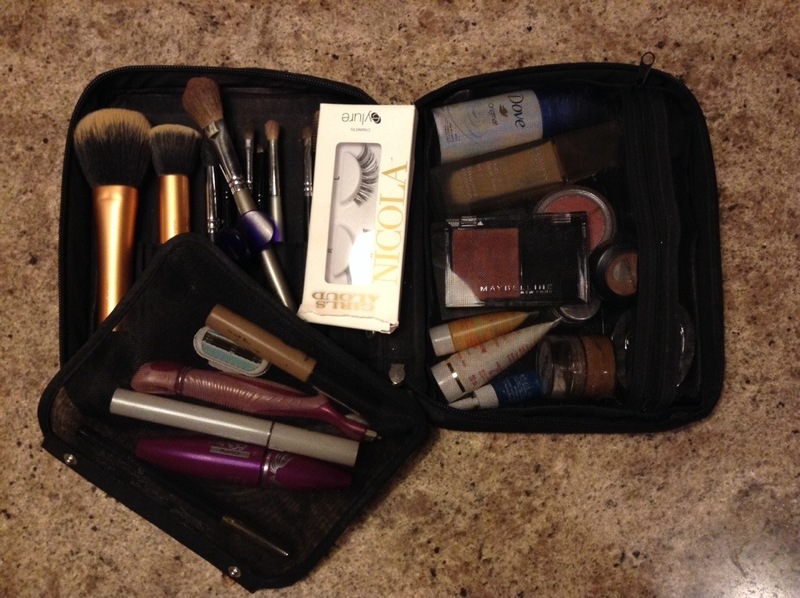 Pingback: The (Makeup) Bag Lady | The Beauty Spot.